It is hard to estimate an objective value of a piece of art. The value of theatrical production as a cultural product also may be decomposed to the value of musical work, certain production and performing. Economic approach of measuring value consists of subjective monetary value of consumer from buying a product that is called willingness-to-pay. For a case of performing arts, willingness-to-pay for a ticket in a theatre contains includes values of production, play at a particular day, venue and seat. Willingness-to-pay for a theatre ticket is usually based on the estimation of demand function that is a dependence between number of tickets sold on a play or some part of hall to a play and tickets prices charged by a theatre. However, when estimating a demand function there are two main challenges for a researcher. First is limited capacity of a house and its certain parts. Limited capacity leads to the fact that in the data demand does not exceed the capacity of house, although a real number of people who want to buy a ticket in some cases may go beyond limited capacity. The last case is called censored or partially observed demand and requires special methods of demand modelling. The second challenge is a high degree of demand heterogeneity. This means that we do not know exactly how theatregoers will react to a ticket price change in various categories of seats and performances. This situation occurs when various seats and performances appeal to various segments of audience which may vary by income, cultural experience, ability to perceive quality of cultural product, etc. Thus, it seems to be highly important to account for limited capacity of demand and consider heterogeneity of demand sensitivity to a ticket price change, that will allow us to infer about how audience values certain performances types and characteristics in terms of willingness to pay. We conduct a research of willingness-to-pay of Perm opera and ballet theatre audience. Perm Opera and Ballet Theatre is directed by world-known conductor Teodor Currentzis and considered as one the best musical theatres in Russia. It is famous for its modern musical productions, non-standard classical performances and unconventional festival projects. Historically, Perm Theatre has been a major Russian centre for ballet where the quality is paramount. Every year the theatre performs forty regular productions and three to five new productions. In order to estimate a demand function for performances and seats we took the tickets sales data from the theatre sales system and aggregated it to the level of performance and groups of seats where price is equal (seating areas). Estimation of demand function with possible unobserved heterogeneity and limited capacity was handled with machine learning method based on the idea of regression trees construction. When building a regression tree we consider that if we divide all performances, for instance, on ballets and operas, or all seats on seats in stalls and circle, then two resulting models estimated on two subsamples will provide better prediction of ticket sales compared with a single model estimated on all performances. The main feature of a regression tree is that it algorithmically chooses the best variables for splitting a sample. These chosen variables are responsible for sources of heterogeneity in demand and, consequently, for willingness-to-pay. 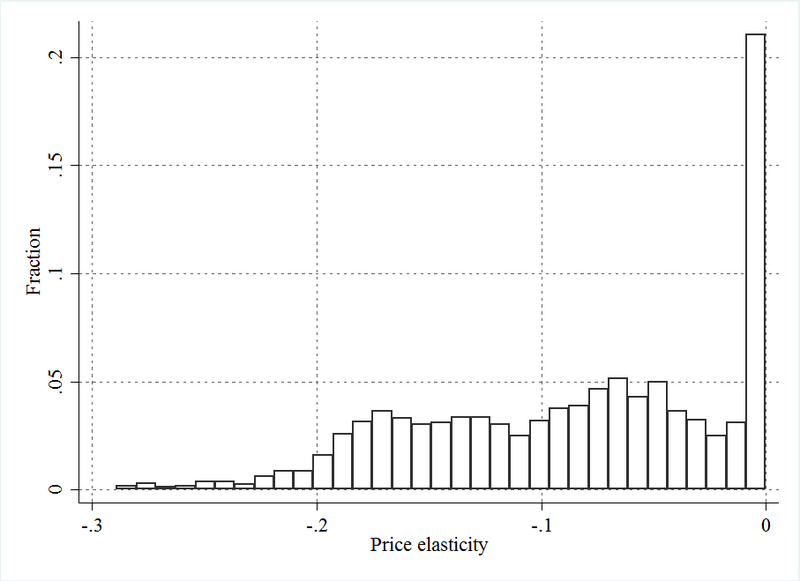 Figure 1 provides a distribution of price elasticity (estimate of demand change) among performances and seats for the case of hypothetical increase of price on 10% from the actual level. A mean estimate of -0.086 means that 10% price increase will lead to 0.8% decrease of ticket sales. Moreover, for 20% of observations, 10% increase of price results in the same observed amount of sold tickets because of substantial exceed of potential demand over seating area capacity. Figure 1 also provides a range of price elasticity over performances that may be explained if one divides all observations on certain performance groups. 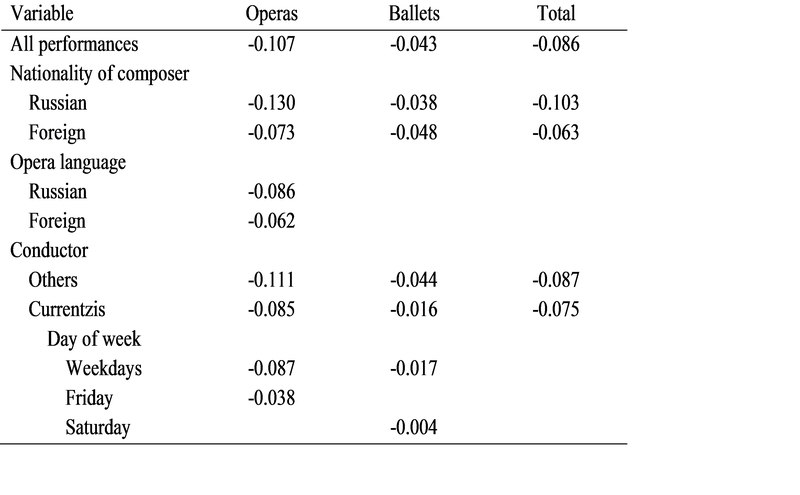 Splitting performances on operas and ballets results in higher sensitivity of audience on a price change of operas than ballets which testifies to a higher monetary value of ballets compared with operas. Among the operas, Perm audience values those written by foreign composers and performed on foreign languages more that operas created by Russian composers and performed on Russian. But for ballets the relation is inverse. Russian ballets create higher value for Perm audience compared with foreign ones because of the strong classical ballet tradition. Among conductors there are also favourites. Along with higher cultural value of performances created by Currentzis which is connected with lower reaction of audience on ticket price, one may also find a higher value from visiting performances conducted by Currentzis at weekends compared with weekdays. This difference in ticket value between different days of play is more connected with the exceptional nature of such a theatre visit and the possibility of going out and showing involvement in cultural life. Ozhegov E. M., Ozhegova A. Bagging Prediction for Censored Data: Application for Theatre Demand, in: Analysis of Images, Social Networks and Texts. 6th International Conference, 2017, Lecture Notes in Computer Science, Revised Selected Papers, Vol. 10716. Springer, 2018. Ch. 18. P. 197-209.